This is my first time to participate in the Say it Forward carnival at 5 Minutes for Mom. I think the idea behind this carnival is a great one, in that it allows you to really focus on someone other than yourself. Sometimes I need that. (Anyone else?) At any rate, I thought I'd mix and blend my carnival participation with some other things because I just typically tend to do that. Enter the game Number Hunt . I stumbled across this game for my two year old, who is presently working on his counting skills, and was curious about it. It's a bit over his head so I decided I'd ship it off to Sky and let her play it with her boys (ages 3 and 6) and write up the review of it. She happily agreed to do so! First of all this game is offered by the Taraluna company. This company's games are printed with soy based ink on recycled paper, which my boys found highly amusing as well as responsible of them. The age group suggested on the box is 4 years old and up. About 15 minutes or less of actual game time. Upon opening the box you are sweetly surprised by the simple game board, one die and four little cardboard playing pieces. I tend to give up on keeping games with hundreds of little pieces and either give them away or recycle them bit by bit as I find them spread throughout the house, so it was refreshing to have an easy but enjoyable box of game stuff! Number Hunt has several ways that you can play, the two we tried were; Count It and Compare It. Compare It was too difficult for my three year old to wrap his head around but it was a good way to show him how four is less then five but more then three. With Compare it you roll the die and move the spaces as before, but if you land on a leaf with objects on it you have to move again; one space back if the number you landed on is less then the number rolled and one space forward if it is more then the rolled number. As I looked at the other number games suggested I could see that they would be over my three year old's head and perhaps a little boring after the first time or two for my six year old. This is a great way to go over math skills gently and improve new skills while having fun. If your child can count and understands the basics of more and less, addition and subtraction then this would be a fun game to play together! As for my two year old, we've been playing with a variety of things, one of which is the 10 Button Book which has 10 buttons tied to it which you can place within the pages of the book, completing pictures as you do so. I was wondering about the sturdiness of this book but it is very well made. The buttons and strings are very well made and not inclined to come loose or fall off. The holes for the buttons are just big enough for the buttons to fit inside. 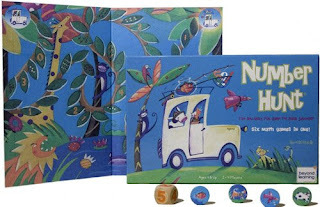 There are ten page spreads, enabling the child to place one to ten buttons on each page while identifying the number. Although my son can count up to twenty, he's still working on number recognition and this book helps a great deal with that. Plus it has the added bonus of lots of stringy things attached to it which for some reason he finds greatly amusing. Go figure. At any rate, he likes it and I like it because it encourages him to continue learning about numbers. I'm all for that! Thanks, Sky, for reviewing Number Hunt for us! And if any of you who have not yet met her, well then allow me the pleasure of the introduction. A pleasure, I assure you, is just what knowing Sky is. I used to live in CC, sounds like you have a great friend in Sky! Great friends are VERY hard to come by!